Today I announced that by midyear I will, in consultation with others, create a criteria for government ministers to assess which departments, functions, and entities in their portfolio are suited to decentralisation. All portfolio ministers will be required to report back to Cabinet by August on which of their departments, functions, or entities are suitable….Departments will need to actively justify, if they don't want to move, why all or part of their operations are unsuitable for decentralisation. I have been on the record and made it very clear that I support Canberra as the national capital and the centre of government. If the Commonwealth wants to consider moving government departments they should be moved from Sydney or Melbourne rather than Canberra, which is a regional centre….I will forcefully fight to ensure our departments remain in Canberra. Then on Thursday morning National’s Leader Barnaby Joyce clarified that whole departments would not be moving out of Canberra. Some sections of certain departments that might be suited to a regional approach could be moved to create centres of excellence outside of Canberra, but these departments might come from Sydney or Melbourne. He also urged big business to consider decentralising to regional cities, where their employees would be able to afford housing and avoid the congestion of the major cities. He also stated that the inland rail project already has a budget of $596 million and to keep an eye out for more on that in the upcoming budget. When questioned about the cost/benefit analysis of moving Federal Government departments, Barnaby Joyce stated that Canberra was built without a cost/benefit analysis. That statement had us thinking here in the CEFA office. 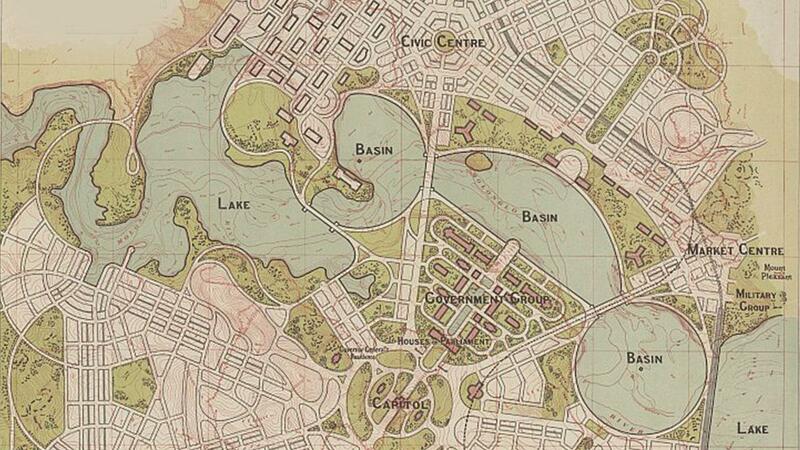 So this week we take a look at how Canberra became the capital of Australia. In the early discussions about forming some sort of federal Government, back in the late 1840’s, the people of the colonies were disinclined to join together as they thought that New South Wales would take over. The entire east coast, across to the middle of Australia, plus New Zealand and Norfolk Island were claimed by Governor Arthur Phillip in 1788 and all of it was called New South Wales. Bit by bit, parts of New South Wales were split off and became new colonies. Once they had separated and created their own Parliaments and Governments, they were not that keen on being governed again by New South Wales. It wasn’t until the 1890’s that federation really gained some steam. The first draft of the Constitution created in 1891 stated that the seat of Government, the capital city, shall be decided by Parliament. An agreement could not be reached as to where the capital of the country should be. During the later conventions there was more discussion about where the capital city could be located. During the 1898 Constitutional Convention held in Melbourne, the Legislative Council of New South Wales suggested that the seat of Government should be in Sydney. Some of the delegates then piped up and suggested other locations. The Tasmanian Premier, Edward Braddon moved an amendment in favour of ‘some suitable place in Tasmania’, while George Turner from Melbourne suggested that ‘St Kilda’ was a better location and Josiah Symon from South Australia recommended ‘Mount Gambier’. Following the final conventions it had still not been agreed as to where the ‘seat of government’ would be situated. As with the first draft of the Constitution, it was going to be left to the new federal parliament to choose the location. The New South Wales Parliament and the people of that colony was unhappy with this draft. They wanted the federal parliament in Sydney. When a Constitutional referendum was held in New South Wales in June 1898 it did not gain a big enough majority to pass. To carry the government of a country there must be a seat of government, some place which may serve as a headquarters where officials may take up their residence, and where the acts of government may be performed. This place is not left to chance or political intrigue; it has nothing to do with the sitting of Parliament; it MUST BE IN NEW SOUTH WALES. That much is quite clear. A referendum on the proposed Constitution with the changed section 125 was held in NSW in June 1899. This time the yes vote was high enough to pass. In 1903 the Federal Government set up another royal commission to reinspect some of the areas the New South Wales Government had identified, along with some other areas that could be a suitable location for the new capital. Albury was this royal commission’s number one pick, with Tumut coming in second, based on topography and general suitability. The parliament still couldn’t come to an agreement on a site in that year. In 1904 the Parliament passed an act requiring the new Commonwealth capital to be within 17 miles of Dalgety, of at least 900 square miles and include access to the sea. The New South Wales Parliament replied pretty quickly, stating that there was no way that they would be granting 900 square miles from any place in their State and that the true intention of Section 125 was that the area should be 100 square miles. The State Government was authorised at that time to grant between 100 and 200 square miles near Tumut, Lyndhurst or Yass. Correspondence continued between the State and Federal Governments for a few years. It wasn’t until 1908 that Canberra was selected to be the Capital of our country, and the federal Government were still insisting on at least 900 square miles of land and access to the sea. In the end the Capital was comprised of area of about 900 square miles, plus Jervis Bay (so they did get access to the sea). The new capital was deemed to require its own port. There was also an agreement with the New South Wales Government to provide access for rail between Canberra and Jervis Bay. In December 1909 the Seat of Government Acceptance Act was passed by the Federal Parliament. An international competition was launched in 1911 to design the new capital. More than 100 entries were received and the Minister for Home Affairs, King O’Malley, accepted the majority decision of the board appointed to advise him on the result. The design of an American couple Walter Burley Griffin and Marion Mahony Griffin was declared the winner. The building works began in 1913, but after WWI broke out the building pace slowed down. Funding was tight and by 1920 not much had been built. Walter Burley Griffin was fired. Slowly the development continued and the Parliament opened for the first time in Canberra on 9 May 1927. The development of Canberra continued gradually until the 1950’s, when Prime Minister Menzies ramped up the process. It was after the creation of the independent National Capital Development Commission in 1957 that government departments began moving from the State capitals to the Federal capital city. It’s a city that was entirely planned. But is that what makes Canberra different? Friends, family and colleagues of CEFA staff live and work in Canberra. Some of them call themselves Canbassadors. They think it’s the best place in the world. The suburb of Crace in Canberra has been found to be the happiest community in Australia. Stan Grant recently interviewed people in this suburb. They were all so cheerful. So what is it about Canberra that makes people love living there so much? Could it be because the schools are good? Income and education levels are a bit higher in Canberra than the national average and the population is a bit younger. What is it that makes people so happy in Canberra? And should we be tearing people away from a place like this? Or could we perhaps attempt to replicate this model in other places in Australia? Is there something about living in a city of just under 400,000 people, where you can easily drive around without too much traffic? A city that is big enough to have the retail shops you need. And a young enough population so that the vibe is still cosmopolitan. Is it the design of the city, the jobs available, or people who live there that make Canberra the place that it is today? Barnaby Joyce yesterday stated that the decentralisation plan, where we will build centres of excellence in regional areas of Australia was a vision for the nation. But, could there be a way to encourage big business to move out of Sydney and Melbourne? It has been suggested that the people of Australia might be more amenable to allowing tax cuts for companies with turnovers of more than $50M if they move to the regions? Maybe you have some ideas? We welcome your comments.